For more than 30 years, Russ Pike has been bringing tired, wooden kitchens, furniture and interiors back to showroom quality with his beautiful hand painting craftsmanship. The qualified craftsman combines his expertise as a traditional painter with a real passion for interior decoration, offering a range of decorative techniques in hand painting and spraying finishes. During this time, Nottingham-based Russ has developed an outstanding reputation for personalised service, high standards and quality finishes, and work by the traditional painter and specialist decorator can be seen throughout hundreds of period properties and contemporary private homes spanning the UK. This same commitment sees all of Russ’s work carry a personal guarantee and full Public Liability Insurance, with every client receiving itemised written quotations and detailed job specifications to explain in detail the project scope and materials used. Russ is also a qualified NVQ Assessor, Painting & Decorating Lecturer and an Assessor for the ICI Paints – Dulux Select Decorator Scheme, helping maintain the high standards of new applications and reassessment of current members to ensure that it continues to offer the finest decorating professionals and delivering quality standards for homeowners. Well networked within the kitchen painting trade, Russ has taken part in numerous community social projects to offer up his skills and time free of charge for good causes. 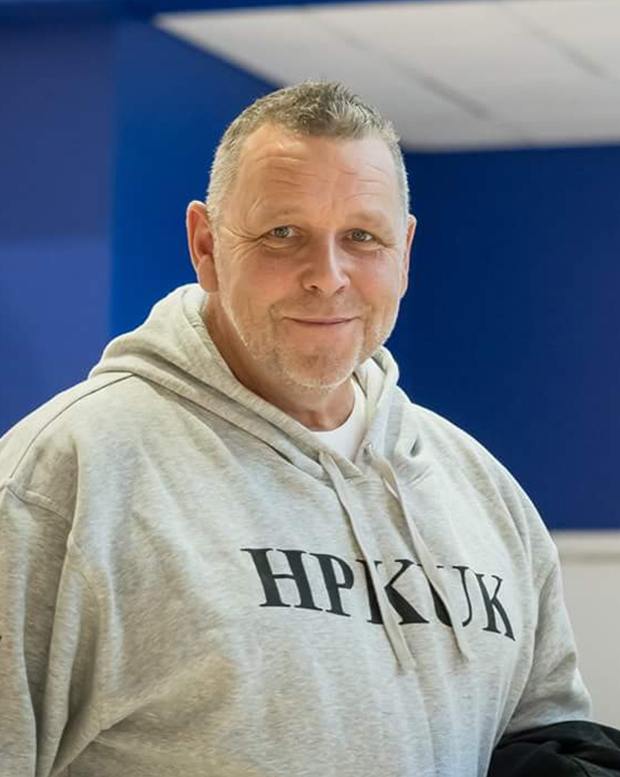 In 2012, the hand painting kitchen specialist took part in a DIY-SOS style challenge to give an old, rundown community centre in Derby a new lease of life, where he joined more than 100 tradesmen, apprentices and volunteers during the two-day conversion project. Since the early 80′s I have worked on myriad projects, but favour the special demands of hand painting kitchens, furniture and period properties, where I come into my own, incorporating specialist traditional techniques with cutting edge efficiency-saving tools and equipment. Throughout the mid 90s as part of my on-going commitment to endeavour to master my trade and offer the best service possible, I consistently attended night school courses to improve and showcase my craft skills; I have studied Traditional Sign Writing, Marbling, Graining effects and Modern / Traditional Furniture Restoration including French Polishing. In 2007 I developed my own furniture repair & touch up course with a Italian Lacquer & Wood Finishing manufacturer based in Venice and worked alongside the Master Furniture restorer for Benetton. I have also attended Conservation and water gilding courses at the Crick Smith University of Lincoln, and have also studied for a Heritage Skills NVQ. I am an approved advanced installer & restorer for Lincrusta wall coverings. More recently I have developed and have been delivering courses in Fine Finishing & Repair as part of the ICI Dulux Decorator Training Programme. Did I mention I also hand paint kitchens, furniture and interiors? The same founding values towards trust, quality and craftsmanship are also upheld by Russ’s own son, Jake Pike, who together with his dad, has delivered hundreds of beautiful hand painted kitchens and interior decoration projects over the last decade. A qualified craftsman, Jake has received several decorating awards for his outstanding work, including being crowned one of the UK’s best Apprentice Paper Hangers of the Year 2011 by the Painting and Decorating Association. If you are based in Nottinghamshire, Derbyshire or the surrounding areas and have a home décor or hand painted kitchen project that you would like to discuss, then contact Russ Pike today. You are can rest assured that you’ll be expert hands with Russ Pike Interiors to deliver a beautiful hand painted interior for your home.